Picture this: your children have just knocked over the lamp in the living room, breaking the CFL inside. Normally, what would you have to do? You’d have to vacate the room for at least 15 minutes. You’d have to shut down the heat or A/C, and then after the fumes have been aired out, you’d have to carefully clean up the glass and mercury. But what do you do if you can’t air out the room because of the extreme cold outside? Or what do you do if you have a special needs child, or elderly parents, that can’t be moved? Well, you’re stuck, right? It’s not a good situation to be in. Soon, however, all these steps will be a thing of the past. Why? Because starting in October, we’ll have access to a safer CFL that captures glass and mercury when broken. Yeah. I was excited too. This week I had the opportunity to speak with Tom Irvine, the CEO of ClearLite. And, I’m thrilled to be able to share this new technology with all of you. Tom’s CFL bulbs (which are qualified by Energy Star) are completely unique, and there are several features that set them apart from the CFLs we’re using now. They use no liquid mercury. The bulb contains amalgam (which is an alloy of mercury) combined with other metals in solid form. If you have silver fillings in your mouth, then you know about amalgam. The bulb is encased with a silicon composite. This means that when the glass is broken the silicone collapses as well, helping trap the glass and metals inside so they don’t escape into your home. The amalgam is much easier to handle than liquid mercury because it comes in hard balls, like tiny BBs. This means it’s a safer alternative for the factory workers where the bulbs are produced. The ClearLite bulbs are encased in a regular glass bulb, which makes them look more like traditional light bulbs. Because these bulbs are encased in silicone the light seems more natural looking. The glass isn’t frosted like regular A-shaped CFL bulbs, which seems to be safer for factory workers. Some of the ClearLite models in the future will be dimmable. So, why has Tom spent the last five years of his life trying to get this new technology to market? Well, one of Tom’s children is Special Needs, and it never sat well with him that every time a CFL broke in their home, he had to worry about contamination. He knew that not only his child, but most children, wouldn’t know they had to leave the room if they broke a CFL. So, Tom decided that fix things. He decided to help invent a better light bulb. It took him five years of two steps forward and three steps back, but he finally succeeded. And come October, we’ll all be able to see these new bulbs first hand. As I said earlier, ClearLite has already been Energy Star qualified, and they’re made to standards set by the Reduction of Hazardous Substances Directive (RoHS). Now when it comes to testing, Tom wanted to make sure that these bulbs really helped capture the glass and mercury. So, he hired Cambridge Materials Testing to break his bulbs and measure the off-gassing. And when I say break, I don’t mean a light tap and a small crack. I mean smash. Want to know what they found? Well, even when the bulbs were completely broken (with the safety coating still intact), the official amount of airborne mercury the analyzer detected was .000, which means there was no mercury released when the bulbs were crushed. The testers thought the machine wasn’t working. So, they retested the bulbs again. But each time, the machine picked up nothing. What’s interesting, however, is that the final test results had to be listed at <.003. Why? Because the machine is not able to pick up an official reading of less than <.003 (which might suggest the machine was not working). The silicone composite shell is what’s so amazing about the ClearLite bulbs. That’s what helps keep all the glass, and all the fumes, from getting into our homes when they’re broken. Tom was kind enough to send me some pictures of what it looks like when a bulb is crushed, and the shell is cut open with a razor. 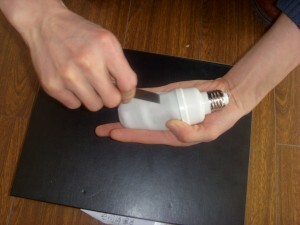 The photos shown are an “A” shaped CFL bulb. All that glass is what the shell helps keep tucked inside. The great thing about the ClearLite bulbs is that when they finally hit the market in October, they’re only going to cost about $1 more than similarly designed CFL bulbs we’re buying now. 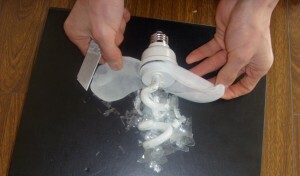 Also, ClearLite bulbs can be recycled just like your regular CFL bulbs. If you can’t tell, I’m really excited about these new ClearLite CFLs. I just broke a CFL at my house a few weeks ago (many of you will remember my panicked post because I did everything wrong when cleaning it up), and I’d love to have a bulb where I didn’t have to worry about that annoyance any more. So, what do you think? I’d love to hear your thoughts on this new product. Tom Irvine, and the ClearLite products, will be profiled in the “new products” section by a major science magazine this fall, so you can keep an eye out for that piece as well. My thanks go out to Tom for taking the time to speak with me this week about this great new product! I really think it’s going to make the world a safer place. So, kudos to you for pursuing your dream! It is very excellent to see new methods to reduce mercury in CFL bulbs. There have been many different stories and a study trying to prove that the amount of mercury in a CFL is minimum. From my understanding the amount of mercury used in these bulbs are so minimal that there really isn’t any serious danger if a bulb breaks. The major area of concern seems to be what might happen if millions of these things end up in a landfill, then small amounts of mercury compound. I mean why wouldn’t a manufacture use a little mercury as possible, it only makes sense. As far as breaking a CFL in your house, I don’t think we have much to worry about. OUUU= this IS exciting! Although I’ve never really worried much about bulbs breaking, I know this is mostly because I don’T have children. Hopefully they’ll also be available in Canada…. I will have to check into that. I’m pretty sure they will be available in Canada when they come out. The company has global distribution in place, which is great. The arrival of the transistor didn’t mean that more energy using radio tubes had to be banned… they were bought less anyway. The ordinary simple light bulb has for many people a pleasing appearance, it responds quickly with bright broad spectrum light, is easy to use with dimmers and other equipment, can come in small sizes, and has safely been used for over 100 years….